Joel and Ethan Coen's No Country for Old Men was 2007's big Oscar winner, but it started its theatrical life as a serious head-scratcher. The New Yorker published a bit of fiction about a married couple returning from the movie theater to discover that they had completely different impressions of what they'd just seen. The droll, violent movie cruises along like many another suspense thriller, with well-defined characters and an easily-grasped "Who's got the two million?" structure. Then it throws its audience for a loop, confusing viewers who happen to blink at the wrong time. In place of righting wrongs and balancing the scoreboard of justice, the story chooses a much darker finale. Politically, No Country for Old Men is a despairing State of the Union message about The War On Drugs ... and this is how things were in 1980. Trailer-dwelling welder Llewelyn Moss (Josh Brolin) stumbles across the aftermath of a bloody drug smuggler shoot-out, and recoups $2 million in a satchel. He foolishly returns to the scene of the crime and is spotted by more smugglers anxious to recover the cash. He shakes them off his trail but is unable to do the same with the frightening Anton Chigurh (Javier Bardem), a killer hired by mobsters on the American side. Sheriff Ed Tom Bell (Tommy Lee Jones) tries to comfort Moss's worried wife Carla Jean (Kelly Macdonald, In the Electric Mist) but feels completely outclassed in this new era of ultra-violent crime. Moss plays a frightening game of cat & mouse with Chigurh, a killer so unstable that his own clients dispatch a second hit man (Woody Harrelson) behind his back. Ed Tom Bell promises Carla Jean that he'll bring her husband back safe, but he's unable to anticipate what will happen next. No Country for Old Men has its touches of Joel & Ethan Coen comedy, but these tend to throw us off the scent of what is really a very serious movie. The movie's laughs are the uneasy kind, as Ed Tom Bell's dippy deputy's remarks ("Gee, our perpetrator was right here!") don't add up to Fargo- grade humor and most of the oddball dialogue is creepy rather than funny. The film reinvigorates some familiar character types -- the luckless local boy in trouble over his head, the wise sheriff who's seen it all and the implacable, unstoppable psycho killer. Josh Brolin plays Moss, the workaday loser who grabs a chance at a fortune. We both sympathize and identify with the thoughtful Moss and his sweetheart of a wife; they're far more deserving than Steve McQueen and Ali MacGraw in The Getaway. But Moss makes one bonehead mistake right off the top, and he knows it's a mistake even before he makes it. Cormac McCarthy's West Texas landscape is too unforgiving to let Moss off the hook, and he spends the rest of the film struggling against losing odds. It's a cruel world, when giving a dying man a drink of water can seal one's fate. Why bother to formulate a foolproof escape plan, when a killer can get your address just by helping an old lady with her luggage? No Country for Old Men's hulking boogeyman is Anton Chigurh, an unnaturally calm killer with an ugly haircut and a truly weird way of doing business. Chigurh uses an unusual killing device and likes to taunt his potential victims with cruel, existential games of chance. An inoffensive gas station clerk (Gene Jones) slowly realizes he's dealing with a dangerous man, and perhaps never knows how lucky he is. Chigurh is obsessive with details and perhaps superstitious, but he also fancies himself as a wildcatting Angel of Death, so unpredictable that his clients unwisely put a second man on his job without telling him. Far too many lame action movies focus on pitiless hit men with bizarre working methods; Don Siegel may have launched the modern wing of this sub-genre with The Lineup and his remake of The Killers. Poor Llewelyn Moss hasn't seen enough hit man movies to know to do things like ditch the original money container, so Chigurh's initial efforts are easy. Later on, Chirgurh does seem to be blessed with unusual luck, as when streets are conveniently free of witnesses. We also see him go through elaborate self-surgical first aid procedures that strain credibility. Anyone who remembers how painful and inconvenient a broken toe can be, will be impressed when Chigurh functions quite well with a knee full of buckshot. That leaves Tommy Lee Jones' Ed Tom Bell, the sheriff who at first seems like an unnecessary addition to the story. Bell wanders onto a killing field where ten or twelve corpses (and a dog or two) are spread out in the dirt, and assesses it all like something that happened years ago. What occurred is obvious but this new kind of drug-smuggling crime is essentially unsolvable. Ed knows that tracing the guns and vehicles will lead to dead ends, and that the bodies are all anonymous Norteño gunslingers. Ed also knows that the huge amount of money involved will bring in violent players like Chigurh and the laconic Carson Wells. Since the big men behind the drug deals hide in glass office buildings and function like corporations, tracing the crime is nearly impossible. The problem is that Ed has essentially given up. It is indeed no country for old men, and Ed prefers to identify with his older buddies, the ex-lawmen and bitter hold-outs who can't distinguish between dangerous killers and innocent kids with green hair -- one old sheriff seems to think that the drug mayhem is a symptom of disrespectful youth. Ed is more sensible. He certainly cares about people like Moss and Carla Jean, but he sorely underestimates himself. Convinced that the case is hopeless, Ed spends most of the movie demonstrating that he's figured out the mystery murder weapon. But he's so demoralized that he doesn't bother to add up the clues ... he no longer believes that these crimes can be solved. No Country for Old Men has a clear eye for landscapes and a fresh way of staging action. Complicated physical effects and stunts (the explosion at the pharmacy) are done in one take, and the wide screen is forever being invaded by new threats against our luckless Mr. Moss. This very bloody (but never bloodthirsty) saga shows the cops always three steps behind the action. It also shows both Moss and Chigurh in curious parallel scenes where they must to bargain with some passing young men. Moss interacts with the guys on the bridge to Mexico, and Chigurh must negotiate with two boys on bicycles ("Hey, your bone's sticking out of your arm.") In both cases, ordinary guys are eager to make a profit from an obviously badly-injured stranger. Joel and Ethan Coen spend half a reel toying with an involved Hitchcock-like bit of business involving hiding a satchel in some heating ducts. Moss does everything right, not that it does a bit of good for his ultimate situation. We know he's asking for trouble when he talks to an inviting girl at an El Paso motel pool 1 ... and the film suddenly does a narrative flip-flop. He'd have been wise to hide out in the girl's motel room. But, "Que ser´, será". Most thrillers make sure to keep audiences abreast of what's going on, which is one reason that the labyrinthine Matrix movies are filled wall-to-wall with expository dialogue. No Country for Old Men lurches into its final reel with the kind of jolt that expresses the effect of real violence in real life. People just 'end' without dramatic death scenes, and the survivors (and us, too) are often left to guess what exactly happened. Dramatic balance is completely thwarted. Moss never meets Chigurh face to face, and for that matter, no official showdown occurs between Moss and Ed, or Ed and Chigurh, either. Everybody who ever came in contact with Chigurh is wiped out, so he remains an unknown quantity. Ed is so stunned that he opts for retirement. The reveal of a key death goes by in such a blur, that some viewers don't realize what happened. Life can certainly be like that. No Country for Old Men is hard-core neo-noir in that its characters seem fated for horrible ends, and virtue is burdened by clouds of despair. Hardly anybody in the picture, from Grandma to Moss to the kid on the bicycle, thinks very far beyond their personal economic situation. Those that act on principles of human decency feel defeated from the get-go. If the lawlessness of drugs is this universally corrupting, maybe it's time to legalize them and put an end to the cycle of killing, crime and madness. 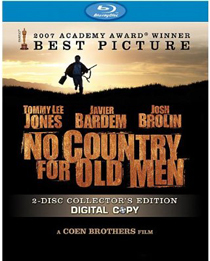 Buena Vista's Blu-ray of No Country for Old Men is a handsome enhanced transfer that looks sensational in Blu-ray HD. A large screening venue is needed to appreciate Roger Deakins' beautiful cinematography. On the other hand, video allows one to freeze on details, should the continuity in that last act become too confusing. The basic extras repeat the interesting behind the scenes featurettes from last year's DVD on the production, the directors and the Ed Tom Bell character. The cast is clearly pleased at the thought of working with the Coen Brothers, even Tommy Lee Jones, who I've seen look less than thrilled in the BTS interviews for The Hunted. Jones speaks at length on the film and his character, saying that the role was so different that he didn't mind being pigeonholed in the same 'western sheriff' part. Spaniard Javier Bardem delights in explaining his outstanding (and Oscar-winning) part. Kelly Macdonald's West Texas accent is particularly impressive after we hear her speak in her natural Scottish accent. We're also impressed by the complicated makeup effects, which allow Chigurh to look as if he's really garotting a deputy with his handcuff chain. The dozen corpses in the shootout aftermath are revealed to all be highly detailed manikins, something I never would have guessed. Joel and Ethan Coen talk about their movie in an oddly shy two-shot, often staring at the ground as they answer. Not everybody likes the Coens' idea of comedy, and some of their statements may sound off-putting, especially when they snicker at the thought of the Carla Jean character being the kind of underclass woman who works at Wal-Mart. I personally have always felt that the Coens are very sympathetic to their characters. They also know this part of the country very well, and communicate its nature in practically every shot. Added extras for the Blu-ray edition include TV excerpts from Charlie Rose and EW, a screening Q&A, an in-store appearance with Josh Brolin and Javier Bardem and various other news and variety appearances by the actors and filmmakers. Six more audio interviews are included as well. The second disc is a digital copy downloadable to PCs, Macs and iPods. Supplements: featurettes Working with the Coens, The Making of ... and Diary of a Country Sheriff, many TV clips from variety shows, interview shows, new programs, in-store and Q & A sessions. Also a digital download disc. 1. An inviting blonde? Drinking around the pool in broad daylight? In El Paso? Poor Llewelyn Moss really has some bad judgment ... even though there's no evidence that he took her up on her offer. Interestingly, the 'poolside woman' is seen only in wide shots ... we never really get close to her. 2. Thanks to Jason Heiser and Chris Saunders for correcting me on this issue. I previously had an entirely wrong interpretation of this scene. Reviews on the Savant main site have additional credits information and are often updated and annotated with reader input and graphics. Also, don't forget the 2009 Savant Wish List. T'was Ever Thus.